We tested the Azimut 80 in Viareggio, the capital city of the Italian boat industry and main operative center of the Azimut/Benetti group - a holding company, which is increasingly considered as the point of reference for national and international yacht design. We might appear exaggerated by saying that the Azimut 80 is a vessel that arrived directly from the future but we are not. In fact she has striking features such as an innovative profile, the rounded aft superstructures and the slender forward ones, the side windows with their characteristic elliptical shape - now considered a trendy feature, only interrupted by a well-integrated support. Sides and superstructures are elegantly connected by means of a fiberglass wing. To light up the VIP stateroom two hatches were fitted forward on deck, while to light up the master stateroom six big portholes were fitted. 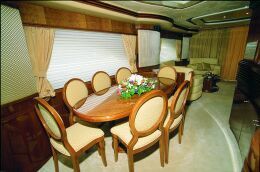 The flying bridge appears as elegant open-air salon, which is very spacious and, thanks to the size of the aft area, offers a good cover to the cockpit turning it into a more comfortable living space. 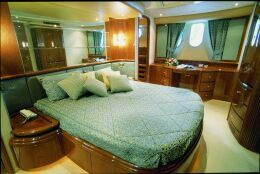 The flying bridge includes two opposite settees, a sunning area, tender davits aft and a forward central smaller deck used as service access from the galley and where a cabinet with grid, sink and fridge is fitted. 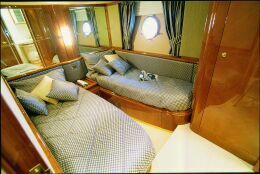 In order to satisfy the different needs and requests, two different layouts for the crew quarters are offered. 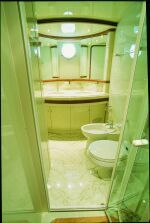 One has a crew dinette, one cabin with two overlapping berths and one bathroom with shower, the other layout offers no dinette but two cabins, one for the captain with a small- sized double bed and the other one with two overlapping berths for the crew. As for the comfort and privacy offered to the guests and the owner, both in the living areas (salon on two levels) as well as in the cabins (four cabins with ensuite bathrooms), the photographs very well describe their sophisticated elegance, which will certainly become very trendy. The photographs also significantly depict the detailed sea trials. The Azimut 80 passed with excellent grades the trials carried out in heavy seas notwithstanding the stresses that were imposed to the boat by the experienced pilot to obtain spectacular photographs. 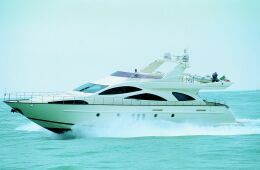 Thanks to its design, the hull is very swift allowing the boat to sail in any conditions offering excellent trim and performance, with the help of two small flaps and an innovative trim tab system, which Silvia Fogliuzzi, Manager of Azimut, kindly but firmly refused to explain for obvious reasons. Finally, we must point out to the extraordinary noise insulation system and to the engine room, an excellent example of space rationality and technology applied to boating. Full boat displacement: 125,827 lbs. Price with standard equipment and test boat power has not yet been defined. 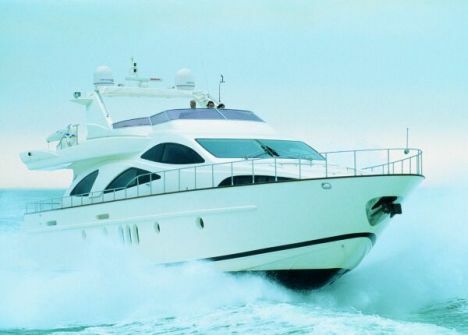 Price quoted for boat fitted with 2x1300 HP MTU is equivalent to Euro 2.375.702 and fitted with 2x1500 HP MTU is equivalent to Euro 2.453.170; Italian VAT is 20% and is not included in the above-mentioned quotations. Description and characteristics of the flying bridge: main access stairwell from the cockpit and service access from the galley with sliding door to port of the helm station. Fully fitted helm station with instrument indicators, settee with service cabinet on the back fitted with an electrical stove, fridge and sink. Two opposite settees with table, roll bar and mast, sunning cushioning, tender with outboard engine and electrical davits aft of the flying bridge for haulage and launching. 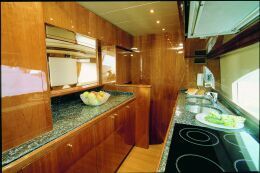 Galley: the galley is separated with access from the port side deck and stairwell to the flying bridge; it is fitted with sizable refrigerator and freezer, granite worktop, double sink with water mixer, communication window with shutter between galley and dinette just like in a bar, oven, exhaust fan, dish-washer, pantry, cabinets and drawers. 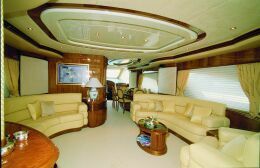 Standard fittings: the above-mentioned fittings plus flaps, bow prop, two generators, air conditioning system, color TV set in the master and in the VIP staterooms. Sea: Force 4/5 long sea along the coast. Electrical switchboard and plants: life on board may be controlled in two different ways, wither with a traditional electromechanical system or with a computerized one with an operating software especially designed and created for this purpose.